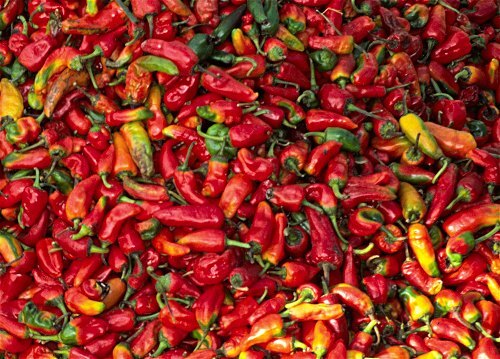 Hot and spicy: chilis drying in the streets of Tozeur. I was wondering about the name of this spice. At first glance, it looks as though it was derived from the country Chile, especially, as variant (but correct) spellings are chili, chile and chiley (Pl. chilies, chiles, chileys, chil�lies). Dictionary.com however states that the Spanish word “chile” was derived from Nahuatl “chilli”. Nahuatl is the Aztec language - so this would point towards Mexico rather than Chile. I found quite an interesting page on Chili peppers at an MSN group. By the way, the sight of drying Chili peppers is nothing new to me, - I saw them in Southeast Asia, South and Central America, Egypt, Nepal… . Maybe the most unusual location was on the bow of a ship cruising the Yangtze River in China.